Last night’s debate was a rollicking, occasionally ribald affair that suggested Quebec politics may not be as bland as the first half of the campaign led voters to believe. 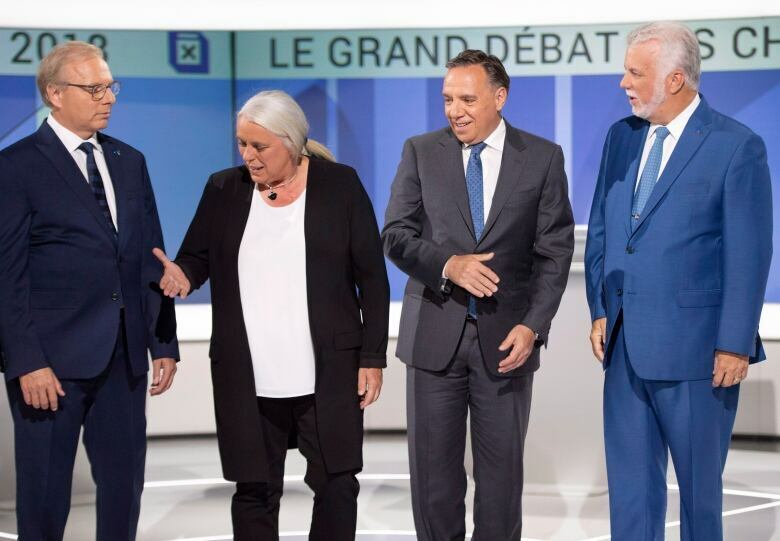 Last night's debate was a rollicking, occasionally ribald affair that suggested Quebec politics may not be as bland as the first half of the campaign has led voters to believe. It featured an impressive array of one-liners (some were even funny), a fair bit of shouting, a reference to testicles and a whole lot of policy. How much credit should we give Philippe Couillard for Quebec's booming economy? The jostling was, perhaps, inevitable given the unique situation of this political campaign. After several decades of two-party rule, Quebec voters suddenly find themselves facing a crowded political spectrum, with four parties registering between 10 and 35 per cent of popular support. To date, the campaign has been fairly staid. The promises have been modest (hospital parking, where to educate four-year-olds) and the scandals minor. And while there has been a little movement in the polls, the standings are the same today as they were one year ago: the Coalition Avenir Québec leading, the Liberals second, followed by the Parti Québécois and Québec Solidaire. The debate last night signalled the ordering we have become accustomed to may not last until Oct. 1, voting day. 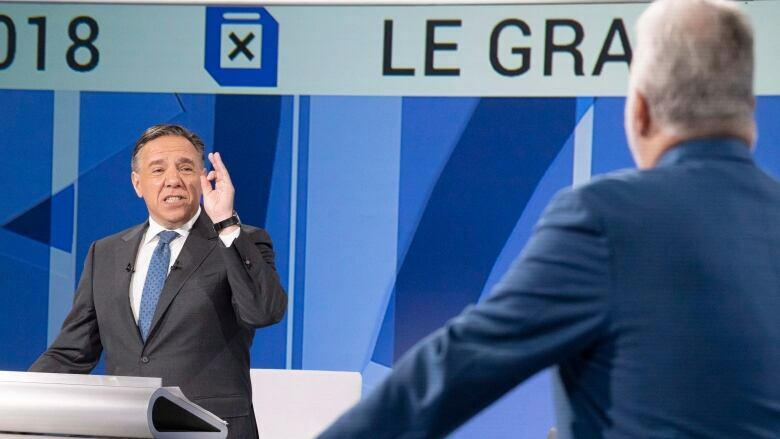 For starters, the front-runner, the CAQ's François Legault, had a difficult night. The three debates — an English one is next Monday, and another one in French will be held Sept. 21 — are Legault's best opportunity to consolidate a lead that has appeared shaky at times in this campaign. The hold-up so far has been his somewhat foggy vision of how he will reconcile his desire to cut taxes while also expanding government services. But he did little to dispel doubts over how he'll do that Thursday, at times struggling to clearly or concisely explain his policy ideals. He resorted to statistics, salary rungs, citations of government documents — not quite the stuff that stirs imaginations. Legault's appeal, though, is based on his message that the state is not firing on all cylinders, and he routinely returned to his favourite examples of government waste. He criticized a Hydro-Québec deal, backed by the Liberal government, to buy wind energy from the Innu, raising concerns the contract could cost the utility billions. He brought up the lucrative pay deal the Liberals struck with the province's medical specialists, promising to rip it up if elected. Legault also didn't waver from his controversial immigration proposals, which include forcing newcomers to pass a French test within three years of arriving in the province. The CAQ leader revealed that his strengths are not in presenting himself as a policy wiz, but in lending voice to popular anxieties and frustrations. Dr. Phil: Cool or cold? Liberal Leader Philippe Couillard, for his part, displayed the reserve that is alternately considered grace under pressure or lack of charisma. 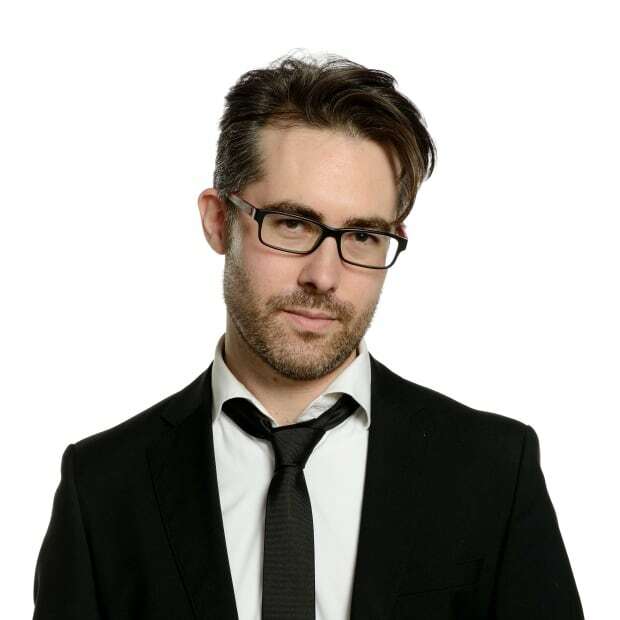 His responses to Legault's attacks on health care and education were cool and measured. 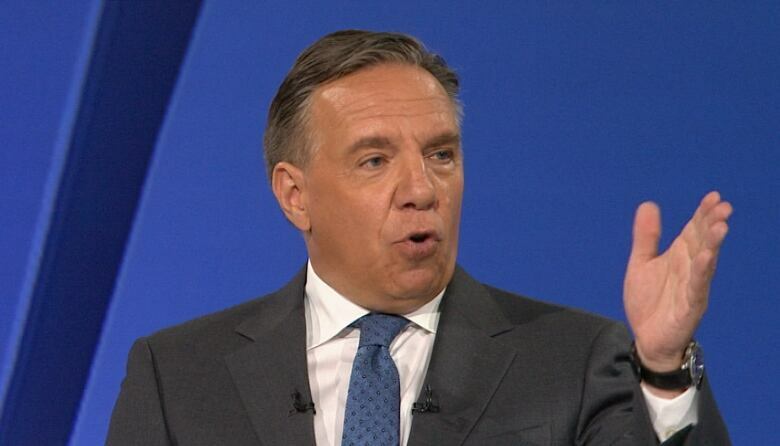 In response to Legault's opposition to the wind energy project, he countered that it is critical to provide economic opportunities for Quebec's rural communities and not to deprive Indigenous people in northern Quebec of those opportunities for development. When the debate turned to immigration, though, Couillard accused Legault of fearmongering. "You're making people scared, Mr. Legault," Couillard said, repeating the line twice. This is one issue where Couillard displays some emotion. He has attacked Legault fiercely over the past week for the CAQ's proposal to lower immigration levels by more than 20 per cent. The danger for Couillard is growing too confident when taking the moral high ground. That's how Legault has been able to neutralize that line of attack so far. He did it again last night. 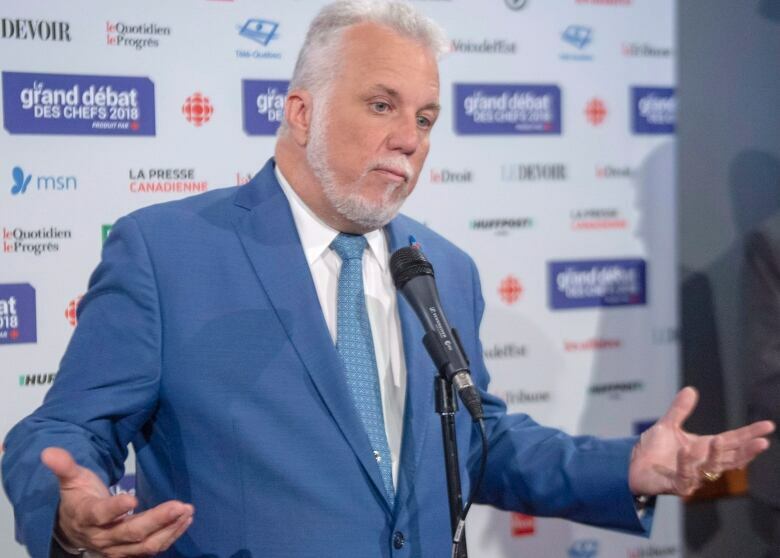 "Quebecers are tired of you lecturing them," the CAQ leader told Couillard. Couillard was also less placid when dealing with the PQ's Jean-François Lisée. To be fair, though, it would have taken a monk to remain calm in front of Lisée. Lisée has managed to breathe some measure of life into the PQ since the start of the campaign, and he debated as if he had nothing to lose. Some of the best lines of the evening belonged to the PQ leader. At one point, for instance, he accused Legault of coming up with policies in the bathtub. But Lisée also pushed the limits of decorum. As Legault was criticizing Couillard over cuts to education, Lisée couldn't resist piping in. He claimed that Legault, at the time of the Liberal cuts, accused Couillard of not having the courage to cut even further. "You said he did not have something that sounds like Couillard," Lisée said, referring to the French word couilles, a slang term for testicles. As the men in the room duked it out, Manon Massé remained quiet for long periods. Moderator Patrice Roy occasionally had to prod her into answering. In one sense, she chose her moments carefully. She spoke the longest, and most forcefully, on issues where the party stands out: public health, free education, the environment. But it was also a lost opportunity to build more recognition for a party that has little support outside Montreal. 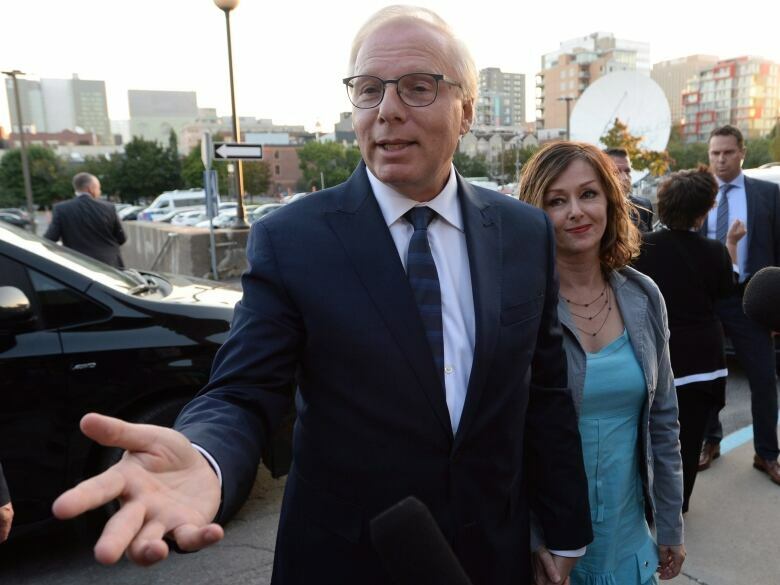 Round one was a little zany and saw widely diverging performances, from Lisée the Joker to Couillard the Iceman, from Massé the Invisible Woman to foggy François. But as a result, a few new story lines become possible, especially with two more debates within the week. Can Couillard mount a comeback? 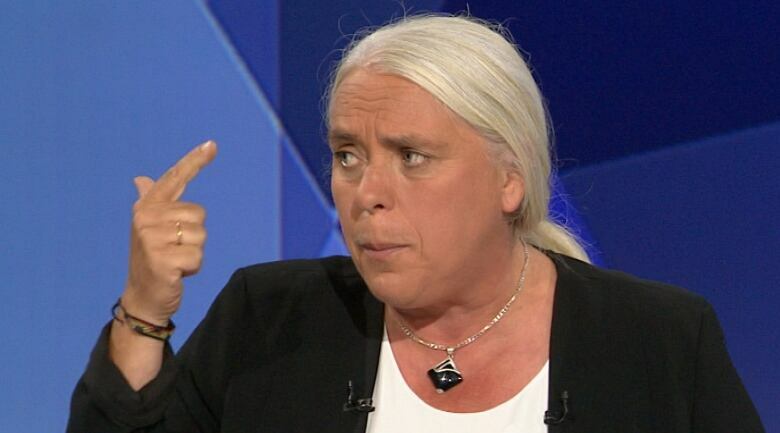 Will the PQ reclaim ground lost to QS? Can Legault stay the course? Quebec's election campaign is about to get interesting. At last.